"Nearly 50 per cent of the Australian surgical workforce is over 55 and is set to retire within the next 15 years, just as we start to experience the biggest ever demand for surgical services." "It takes 10 years to train a surgeon. You do the maths - we are running out of time." What math? Sorry, you lost me there, Russ. For better or worse, Carol Nader led the "front page" of The Age on March 22 with this article, "Battle over surgical monopoly". Obviously she had been working on this for a while. In fact, the whole issue is a longstanding one started by the ACCC, but why she (or perhaps more importantly, Vin Massaro) decided to push it in the middle of the Commonwealth Games coverage where it got buried on (effectively) Page 5 is all rather odd. Not to stop there, 2 days later she decided to follow up with an article on Our Mate Vin but instead has muddied the waters further. What concerns me (as I have said previously) is that I do not know whether reporters like Carol are merely ignorant of the issues truly facing specialist training (and is therefore being manipulated by political interest groups) or whether she is deliberately misrepresenting the situation for the purpose of newspaper sales. The other reason is that the ACCC has taken the trouble to investigate the RACS' role in surgical training - which makes you wonder why the ACCC targeted surgeons in the first place. At this point it becomes a revolving argument. Secondly, it is correct that Vin Massaro was CEO of the RACS from 1999 to 2003. I am not privy to his reasons for leaving the college or being hired by this university consortium, but it is just plain wrong to refer to him as "Uni push surgeon a college veteran". Our Mate Prof Vin is not a surgeon, or a medical doctor, but an academic with an interest in higher education policy. He worked very hard to represent the college of surgeons' interests when working with them, and now presumably works very hard to represent this consortium's interest (even if to the detriment of the college). "The Commission should reconsider the involvement of medical schools in the training of specialists, through a parallel stream of training, so that new training pathways can be tested. These could include enabling students to begin their specialisation studies while undertaking their initial qualification thus reducing the length of the specialist training programs. Reducing the length of the training program would not directly affect the standard of clinical services or the quality of the graduates. Australia has a longer training program than the US and Canada (and now the UK), yet the standard of health care in those countries cannot be regarded as inferior to Australia's." 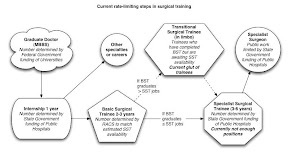 Perhaps Our Mate Vin should consider the fact that training systems in the UK are no shorter than in Australia, and that the latest revolution in US surgical traning is to implement schemes remarkably similar to (and almost as long as) those that exist here. And do you seriously believe that shorter and less training will not affect the quality of clinical services among graduates? I guess we can cut the medical course back from six years to four then... oh we have already done that. My bad. At best I can only assume that the Vinster is not talking about shortening surgical training, but skipping internship and junior HMO jobs, where we learn the essentials of being a real-world doctor. Where we learn to respect the methods of our colleagues in other specialties, so that we can see the bigger picture when treating our patients. Where we can see and then decide which specialty we would actually consider working in. Where we act as the backbone of the public hospital system by doing all the day-to-day work like putting in IVs, writing drug charts, ordering and checking pathology and radiology tests, talking to patients and staying up all night to deal with those 3am acute febrile / hypertensive / nausea / insomnia / psychotic episodes. Yes, let's get rid of those doctors so that we can yo-yo the number of trainees in the pipeline temporarily. But it does not take a rocket scientist to see that if I have to do 100 supervised rhubarbectomies to qualify as a rhubarb surgeon, and I only see 20 cases a year, then it will take... oh let's see, 5 years. So if we introduce an "alternative pathway" then my mate and I have to share the rhubarbs, and get 10 each a year... hang on, now I have to train for 10 years! How does that generate surgeons any faster? Oh, I see, we will just go to lectures on rhubarb theory and practise on rubber rhubarbs instead. Fourthly, Old Vinnie Boy knows full well that the current rate-limiting step in the production of qualified, competent specialist surgeons is the provision of accredited training posts by the State and Federal Governments. He has said so himself. The State Governments have an interest in preventing basic surgical trainees from entering specialty training - that way they generate a glut of hospital medical officers, driving down salaries and conditions so that these doctors can have the privilege of being overworked and underpaid to give their all caring for patients. The Federal Government has an interest in limiting specialist numbers because this prevents patients having more access to surgery, procedures and drugs, all of which they would have to fund. In a letter to federal Health Minister Tony Abbott this month, the universities said they hoped to start providing post-graduate specialist training as early as 2007. They will seek approval from the Australian Medical Council, which provides accreditation for training. They have also asked governments to fund training places in hospitals. College of Surgeons president Russell Stitz said the college would be "quite happy" to work in partnership with universities, but said it would be unrealistic for them to become alternative providers at the moment. "They haven't got the capacity, they don't have surgeons that they can draw on, and how are they going to do it? Are they going to pay the surgeons? Because I can tell you the surgeons are not going to work for the universities for nothing." Perhaps Our Mate Vin knows more than he is letting on... is setting up an "alternative pathway" code for "time to pay up, Governments"? The universities can only fund training if they start paying the trainers, something that the RACS has enough loyalty among fellows to avoid currently. All of that goodwill may evaporate soon if the current push to commodify surgical training continues. And given that accredited training jobs will not increase unless funding increases, any agreement by the Governments to fund university teaching will probably lead to a widespread funding increase to all parties (RACS, Hospitals and Universities). Somehow I think that ain't gonna happen. Sadly, it is public perception (and that of the ACCC) that surgeons have a vested interest in limiting their own numbers. If that were so, we would not be giving up our time and energy pro bono (according to Russ-boy, $240 million worth a year) to train our colleagues, we would not be asking Government to fund more training positions, and we would be looking forward to our workload increasing, year by year, until we all died of exhaustion. Perhaps it is against the tidal wave of public opinion, but I believe that surgeons, like all other doctors, have the primary goal of giving our patients the best possible care that we can provide. At the end of last year, topping up a wound with local anaesthetic at the end of the case. Self-safing (retractable) needles, IV cannulas are great, but in many ways they make things more difficult because they are always more difficult to manipulate (especially in difficult situations, small, fragile veins, awkwardly positioned patients) than the original. 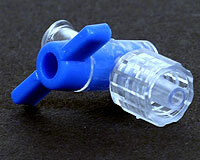 There are many times that I have lost an IV because the retractable needle was too sticky when removing it from the IV cannula (I use a single-handed IV insertion and setup technique, while the other hand steadies the vein). By far and away, though, I think the biggest contribution to avoiding needlestick injuries are the needleless infusion systems, using IV bungs (reflux valves) and Luer locks. Unfortunately many hospitals are too cheap to stock true Luer lock syringes (that twist and lock in) and just get Luer slip syringes. 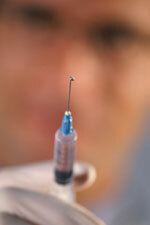 In that setting spray exposure from a loose fitting syringe-to-bung is rather common. "A benefit will not be payable if: ... a medical cure is found for Acquired Immune Deficiency Syndrome (AIDS), or the effects of the HIV virus, Hepatitis B or Hepatitis C, or in the event of a treatment being developed and approved which makes these viruses inactive and non-infectious." Even if such treatment is hideously expensive or years away from market availability? "... you have AIDS or any AIDS related disorder or a positive blood test... unless you are able to provide evidence, in the form of sequence analysis of the source and index virus strains, satisfactory to us that the accident involved the definitive source of the virus." Why would I be applying for this cover if I already had HIV? What kind of product do these guys think they are offering? I think I will rely on my Income Protection Insurance, so I have thrown it in the bin. In light of recent events, I must point out to all doctors (and other medical professionals) that stress is a daily part of our work, and that there are things that can be done about it. Unfortunately we work in a profession that is gradually being broken up into little pieces. Doctors used to do everything, make diagnoses, do the laboratory tests, check our own histology, grind up our medicines, dress all the wounds, counsel the patients, and lead them through their exercise and rehabilitation program. Nurses have always been our partners in most of this care. Increasingly, much of our work is now delegated, either to other specialist colleagues (pathology, radiology) or to other, newer, allied health groups such as physiotherapists, psychologists, radiographers, occupational therapy, dietetics, anaesthetic technicians, phlebotomists, ECG technicians. While their roles are quite clearcut, the doctor's role is no longer. Like ward nurses, we have to pick up, sort out, and deal with any problems or issues that falls into the cracks between these other groups. We become a hospital "dumping ground" because if something is nobody else's fault or problem, it is still ours when we come back to work the next day. Even worse, we bear the brunt of the social and medicolegal responsibility of all of this work, and that responsibility does not stop at 5.30pm on weekdays. On top of all of that, we deal with the whole spectrum of human emotions with our patients, and then we are expected to go home and balance our personal lives in the midst of overwhelming work and study requirements. It is not surprising that the incidence of "burnout", "nervous breakdowns" and suicides among doctors is among the highest of all professions. Interestingly, attempted suicides are rare among doctors... knowledge and access means that they almost always succeed. So if you feel that you or a colleague are over-stressed, not coping, depressed, overwhelmed, or unsafe, then take a step back. Take a deep breath, look objectively at what damage you are doing to yourself, your patients, and your family. If the problem is not one you can solve alone, then turn to someone who can help, whether it be your professional association, a friend, or an organisation like the VDHP. 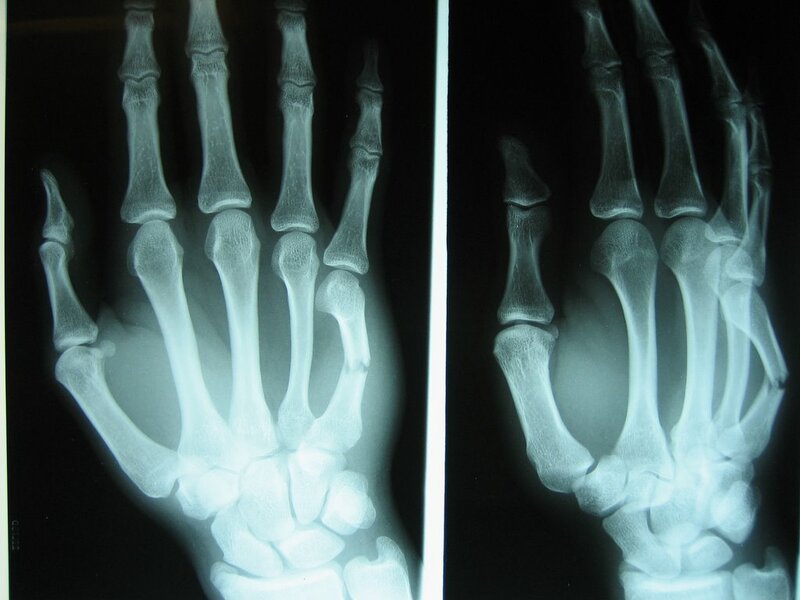 BBC - "Many doctors prone to stress"
Gasbagging recently put up some photos of a 5th Metacarpal shaft fracture (not quite technically a Boxer's Fracture). "I was ropeable. I was pumped up and about to hit someone... so at least I punched a wall (or a window) and not a person!" What is it about them that they think they have to punch something? Why can't they contain their rage or vent it elsewhere (onto something soft)? As far as I can tell, there is about as much justification for punching a wall as self-mutilation. Oh, perhaps that is a topic for some other day.